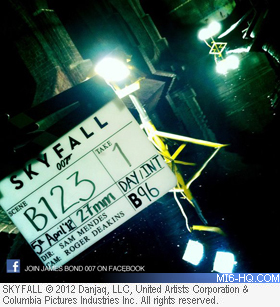 The "Skyfall" crew have been busy completing a complex chase sequence this week, both on location in London and at Pinewood Studios. The latest clapperboard, numbered #123 comes between sequences seen in a London tube station and the beginning of an over-ground chase in busy London traffic. The scene was filmed in the Pinewood wet tank and the shot above may remind fans of the underground sewers sequence in the 1963 film "From Russia With Love", which shot on location in Turkey. Bond will return to Istanbul in "Skyfall" but the sequence of events as we understand it means that this is not a Turkish sewer. Thanks to `jamesh101` for the alert.